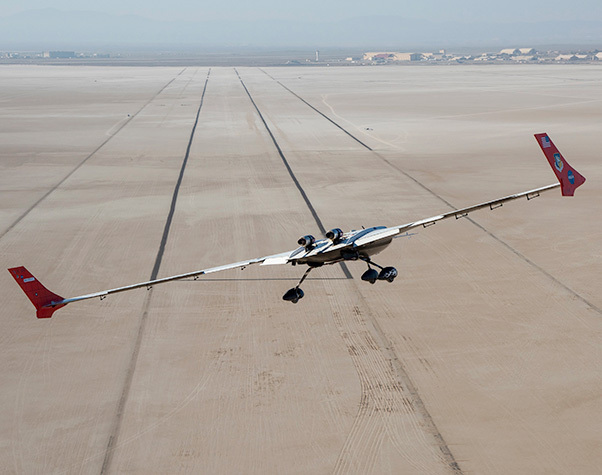 The remotely piloted X-56A on final approach to landing at Edwards. In its seventh decade of operation, NASA’s Armstrong Flight Research Center at Edwards Air Force Base, Calif., continued to advance the agency’s overall missions of aeronautics research, Earth and space science. The center has also been working to integrate NASA technology into the commercial airspace sector, supporting development of aerospace technology, and sharing results with industry, academia, and the public. Researchers at Armstrong are dedicated to facilitating an understanding of aeronautics concepts and demonstrating the role that flight will play in the nation’s future. In 2018, NASA researchers continued to explore the benefits of long, thin, high-aspect-ratio wings for use on future long-range aircraft including fuel-efficient airliners and cargo transports. Unlike shorter, stiffer wings found on most aircraft today, slender, flexible airfoils are susceptible to flutter and may be stressed by bending forces from wind gusts and atmospheric turbulence. To address this problem, NASA is using the X-56A Multi-Utility Technology Testbed (MUTT), a small, remotely piloted experimental aircraft developed by Lockheed Martin Skunk Works for the Air Force Research Laboratory (AFRL), to investigate technologies for active flutter suppression and gust-load alleviation. Hopefully, this will lead to improved ride quality, efficiency, safety, and improve the long-term health of flexible aircraft structures. Lockheed Martin and AFRL performed initial testing of the X-56A in late 2013 and early 2014 to collect flight data on highly flexible structures and flutter suppression control techniques. The MUTT was eventually transferred to NASA Armstrong for research into lightweight structures and advanced control technologies for future efficient, environmentally friendly transport aircraft. The subscale demonstrator is a hybrid wing-body configuration spanning 28-feet wingspan and weighing about 480 pounds, powered by two 90-pound thrust turbojet engines. Lockheed Martin built two center bodies and several sets of stiff and flexible wings to be used in various phases of testing. In November 2015, one of the two vehicles crashed during the first flexible-wing checkout flight, sustaining irreparable damage. The second vehicle has been used to validate improved flight control systems for flutter suppression. Test flights in 2018 focused on building good aerodynamic models to predict the speed at which flutter will occur and then demonstrating flutter suppression with a modern flight control algorithm. Artist’s concept of the X-59 Quiet SuperSonic Technology X-plane, or QueSST, that will begin flying in a few years. 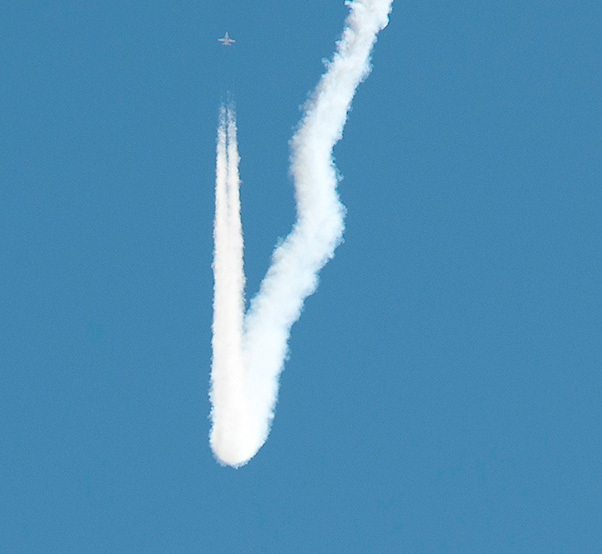 A NASA F/A-18 demonstrates the quiet supersonic dive maneuver, creating a dull thump instead of a loud sonic boom. NASA scientists are also exploring methods for reducing aircraft noise as well as controlling and lessening the effects of supersonic shock waves, in the hope that federal regulators may one day allow commercial and civil supersonic flight over land in the United States. Such flying is currently restricted to military training operations within tightly controlled supersonic corridors in the National Airspace. In February 2016, NASA awarded a contract for the preliminary design of a “low boom” flight demonstration aircraft as part of the agency’s New Aviation Horizons initiative introduced in the Fiscal Year 2017 budget. NASA selected a team led by Lockheed Martin to complete a preliminary design for a Quiet Supersonic Technology (QueSST) demonstrator, which was eventually designated X-59. In advance of QueSST flights, researchers from NASA’s Armstrong and Langley Research Centers deployed to Houston and Galveston, Texas, for the Quiet Supersonic Flights 2018, or QSF18, test series. For this effort, a NASA pilot performed a unique diving maneuver over the Gulf of Mexico in a supersonic F/A-18 fighter plane. This technique transformed the usually sharp sonic boom into a quiet thump. 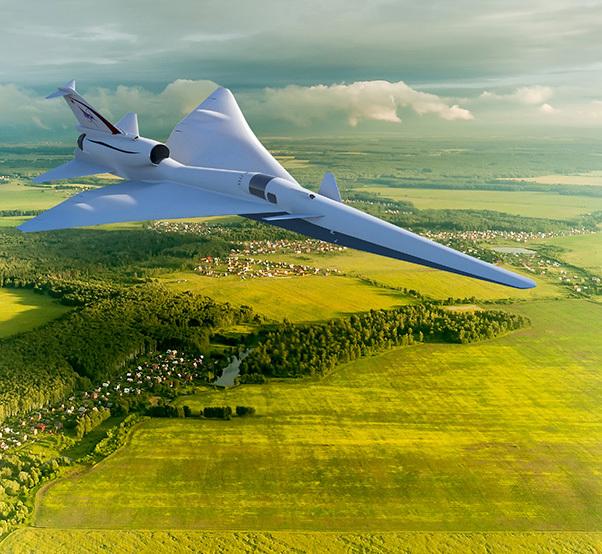 Researchers used acoustic measuring equipment and collected public comments in order to better understand how to engage and obtain data from a community unaccustomed to phenomena associated with supersonic flight. 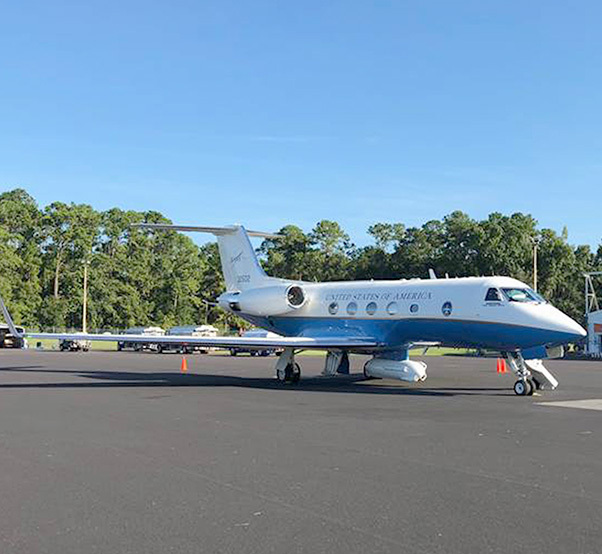 Another series of flights, using a modified subsonic Gulfstream III business jet, demonstrated technologies to significantly reduce aerodynamic noise generated by aircraft during takeoff and landing. The Acoustic Research Measurement (ARM) flights tested technology to address airframe noise, that which is produced by non-propulsive parts of the aircraft. Several experimental concepts were applied to various airframe components including landing gear fairings and wheel well cavity treatments, as well as the Adaptive Compliant Trailing Edge (ACTE) wing flap previously flight-tested to study aerodynamic efficiency. Research crews flew the aircraft at an altitude of 350 feet over a sensor microphone array on the Rogers Dry Lake at Edwards Air Force Base. Results showed a 70 percent noise reduction, a crucial milestone that may lead to quieter aircraft, which will benefit communities near airports and foster expanded airport operations. NASA’s Ikhana UAV was flown into the National Airspace System for the first time without a chase plane. Over the past several years, NASA has worked with the Federal Aviation Administration and industry partners to develop technologies that support safe integration of unmanned aircraft systems into the National Airspace System. 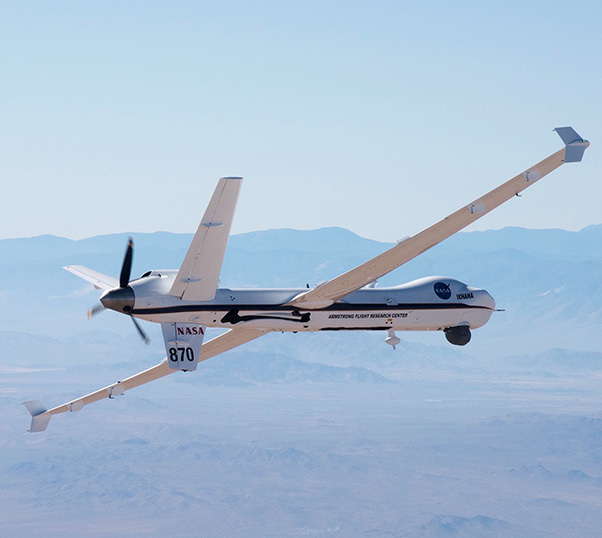 Previous tests successfully demonstrated two detect-and-avoid algorithms developed by NASA, General Atomics Aeronautical Systems Inc., and Honeywell that generated precise alerts necessary for a pilot controlling a UAS from the ground to remain well clear of other aircraft. 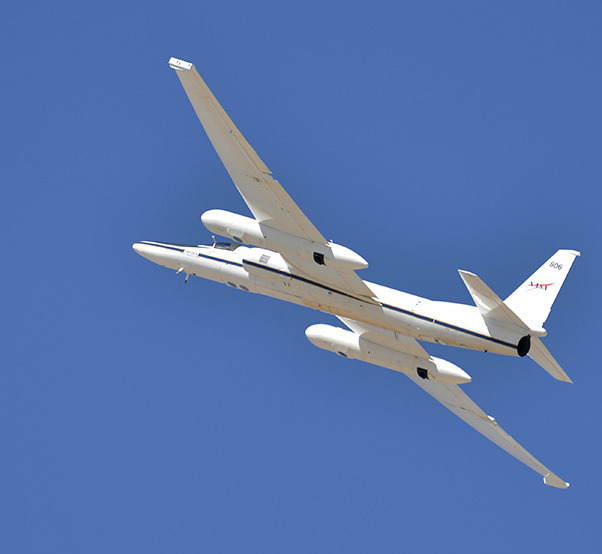 Armstrong continued this effort in 2018, achieving a major milestone when NASA’s remotely piloted Ikhana aircraft flew into the NAS without the need for a chase plane or visual observers while operating in various classes of airspace. Ikhana is the first UAS for which the FAA has granted a No Chase Certificate of Waiver Authorization. 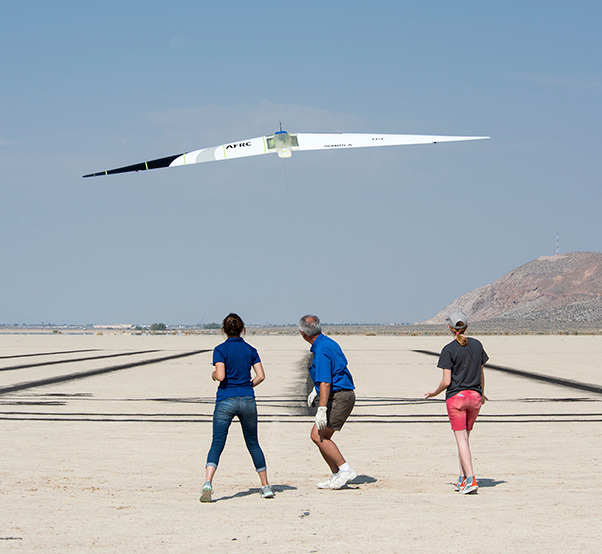 Deborah Jackson, Al Bowers, and Abbigail Waddell launch the subscale Prandtl-D 3C glider at Rosamond Dry Lake. This past summer, researchers at Armstrong continued working on an increasingly complex remotely piloted aircraft concept called the Preliminary Research Aerodynamic Design to Lower Drag, or Prandtl-D. This design features an innovative method for determining the shape of the wing with a twist that could lead to an 11-percent reduction in fuel consumption. The concept may also lead to significantly enhanced controllability that could eliminate the need for a vertical tail and potentially to new aircraft designs. Several radio-controlled models of increasing size, spanning up to 25 feet, have been tested. Students from several universities assisted Armstrong chief scientist Al Bowers with developing, testing, and integrating a pressure measurement system into the Prandtl-D glider. A flight series in August demonstrated this system, providing additional evidence that a wing design method using twist can dramatically increase aircraft efficiency. We may not yet have flying cars but Armstrong has a direct role in NASA’s ongoing leadership in Urban Air Mobility research to develop a safe and efficient system for passenger and cargo air transportation in and around urban areas. In November 2018, NASA announced plans for a UAM “Grand Challenge” during a two-day industry symposium in Seattle and discussed the results of two recent UAM market studies. The UAM Industry Day marked the first step toward revolutionizing mobility within urban areas by enabling a safe, convenient, environmentally friendly and accessible air transport system. Barriers to UAM operations include safety certification of autonomous vehicle systems, community noise impacts from vehicle operations, cyber security protections, safe airspace integration with traditional airline operations, and many others. These issues are closely tied to NASA’s current research portfolios. Additionally, piloted aircraft and UAS will have to be fully integrated into the National Airspace System for air traffic control and be able to operate safely in in crowded urban areas. Community acceptance of UAM operations poses a significant challenge as well. Although NASA will not directly contribute design input for potential UAM vehicles, the agency will provide technical leadership in areas such as the safety, operational integration, and community noise challenges. NASA and industry partners will conduct joint flight research in support of the creation of industry standards, FAA rules and procedures, and city ordinances. 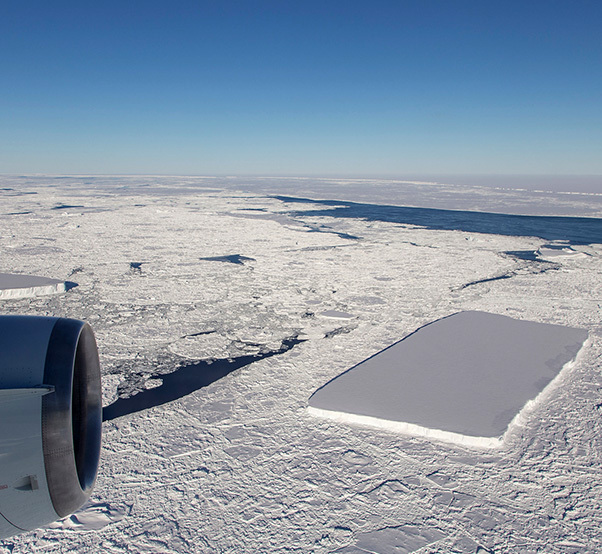 Two rectangular icebergs were spotted from the NASA’s DC-8 during an Operation IceBridge flight over the Antarctic Peninsula on Oct. 16, 2018. In April, the center’s DC-8 flying laboratory began its fourth and final trip around the world for the Atmospheric Tomography (ATom) airborne science campaign. Scientists onboard measured airborne particles and collected samples from the remotest parts of the atmosphere to better understand the processes that govern how various greenhouse gases cycle around the world. The aircraft, a modified airliner equipped with scientific instruments, departed California on a 26-day journey to take atmospheric samples near the North Pole, the tropics, the Southern Ocean around Antarctica, across the southern tip of South America, then north over the Atlantic Ocean and across the Arctic Ocean to Alaska, ultimately returning to California. In October and November, a team of scientists aboard the DC-8 undertook the 2018 Antarctic Campaign of the ongoing Operation IceBridge. Radar and laser altimeter measurements from these missions documented changes in polar land and sea ice to evaluate climate models. The DC-8 also carries a high-resolution camera system. Data from these missions have helped scientists bridge the gap in polar measurements since the failure in 2009 of the Ice, Cloud and Land Elevation Satellite (ICESat). A replacement, ICESat-2, was launched in September. The 2018 IceBridge mission objectives included validating that the new satellite was ready for operation. The Student Airborne Research Program celebrated its 10th year, as 28 undergraduate students participated in an eight-week immersive NASA airborne science field experience. The SARP program provides a unique opportunity for undergraduate students majoring in the sciences, mathematics, and engineering to participate in all aspects of a NASA airborne science research campaign. Flying aboard the DC-8, the students sampled and measured atmospheric gases to study air quality in the Los Angeles basin and California’s Central Valley. While deployed to Gainsville, Fla., NASA’s C-20A carried a UAVSAR pod to collect data on hurricane damage in the region. Multiple NASA aircraft including the C-20A and ER-2 supported disaster relief efforts during the wildfire and hurricane seasons. The agency’s C-20A aircraft, a modified Gulfstream III, deployed to North and South Carolina to support emergency relief efforts in the wake of Hurricane Florence. A team of scientists used the Uninhabited Aerial Vehicle Synthetic Aperture Radar (UAVSAR) instrument to map flooded regions to assist Federal Emergency Management Agency and a University of South Carolina science team that was already conducting field research on flood inundation prior to the disaster. The C-20A and the ER-2 high-altitude research aircraft also supported emergency response for multiple California wildfires. Both aircraft carried scientific instruments to map the burn scar areas. Resulting data helped officials estimate resources needed to recover from the fire, as well as to identify areas at risk of mudslides ahead of the winter rains. The SARP students also used ER-2 remote-sensing data to study drought, fire damage and debris flows in Southern California, and ocean biology along the California coast. Students also took measurements at field sites near Santa Barbara, Sequoia National Forest, and the Salton Sea. In another part of California, NASA Armstrong pilot Scott Howe, who was serving as a part-time member of the California Air National Guard, assisted with the blazes by piloting the guard’s MQ-9 remotely piloted aircraft to monitor raging wildfires. 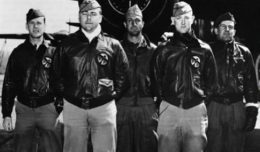 Howe was chosen for that role because he was one of the pilots of NASA’s Ikhana aircraft, a civilian variant of the MQ-9 based at Armstrong. An infrared telescope on the SOFIA 747SP gave astronomers a unique window on the universe, one unavailable to ground-based observatories. 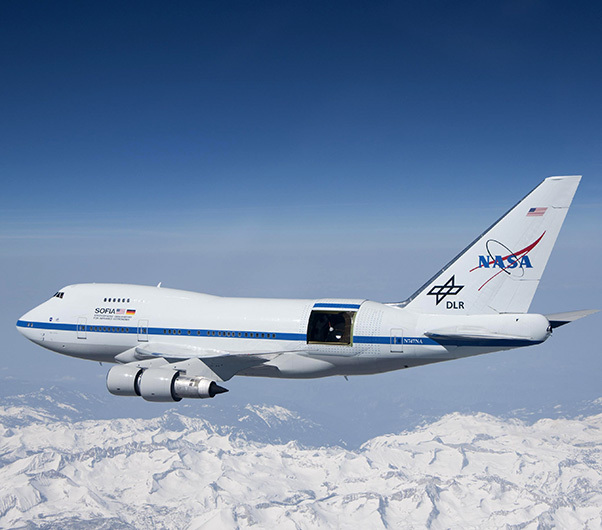 NASA’s Stratospheric Observatory for Infrared Astronomy program contributed to several major scientific discoveries in 2018, during deployments to Christchurch, New Zealand, and Daytona Beach, Fla. Astronomers use the airborne observatory to study rare astronomical events that most ground-based telescopes cannot observe. Researchers aboard SOFIA discovered that magnetic fields are trapping dust and sending it into a supermassive black hole near the center of the Cygnus A galaxy. Magnetic fields may explain why some black holes appear to be gobbling up material from their surroundings and ejecting ultra-high-speed jets while others, like the at the heart of our Milky Way Galaxy, are not. Observations from SOFIA found evidence that star clusters form through collisions between giant molecular clouds. This contradicts traditional models suggesting that gravitational forces alone were responsible for the formation of stars and star clusters. Researchers also found that powerful, magnetized winds flow outward from above and below swirling disks of gas during the formation of massive stars. These winds blow cavities through the dense clouds of interstellar dust, giving researchers a clear view into the stellar nursery and allowing them to learn about the structure of protostars and test different theoretical models of star formation. 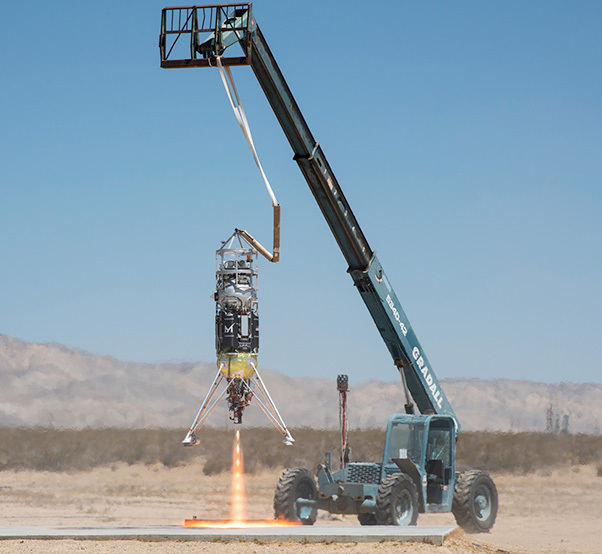 Masten Space Systems’ Xodiac rocket flight-tested a pneumatic sampler collection system at Mojave Air and Space Port. Armstrong manages NASA’s Flight Opportunities Program (FOP) under the agency’s Space Technology Mission Directorate. The program provides opportunities for large and small businesses and universities to demonstrate technologies of interest to NASA in a space-like environment by testing them on board commercial suborbital launch vehicles, reduced-gravity parabolic aircraft flights, and high-altitude balloons. Building a flight heritage enables these technologies to be more readily included in future NASA projects and to stimulate the growth of the U.S. commercial spaceflight industry. In January, high-altitude balloon flights by World View Enterprises helped advance technology to determine how and why the Earth evolved to be suitable for life, while other planets in the solar system did not. A second balloon flight in May evaluated two technologies for monitoring radiation exposure during space-based missions. Zero Gravity Corporation flew parabolic flights in a modified Boeing 727-200 to simulate microgravity conditions. These missions were flown for a variety of purposes, from testing proposed new space suits to cryogenic propellant research. One flight in November carried an experiment on the behavior of dust on surfaces in space. Another set of parabolic flights in June advanced space technologies for a Mars sample return mission. Masten Space Systems flight-tested a rocket carrying technology that may one day be used to bring back a sample of surface soil from a celestial body such as an asteroid. Such samples provide clues to the early history of the solar system. In April, Blue Origin launched the company’s New Shepard rocket for a company vying to be the first Internet service provider in space, as well as a NASA monitoring system for testing technologies on suborbital vehicles. A small rocket launched by UP Aerospace carried an experimental thermal protection system as well as an flight termination system and a device for monitoring the internal environment of a spacecraft, including acceleration forces on payloads.